Since we have the power to change our thinking, we also have the ability to alter our emotions. Stress is largely a person’s own creation. Most of the stress we encounter is prompted by challenges in relationships, in situations, and in how we handle our own thoughts. Thinking (cognition) significantly affects feelings (emotions), which in turn impacts stress levels. significantly reduce stress, promote responsibility, increase effectiveness, and improve relationships—regardless if the stress stems from work, parenting, teaching, relationships, or any other situation. You will learn how to live a happier and more enjoyable life. What is the one (1) phrase that can immediately reduce your stress? 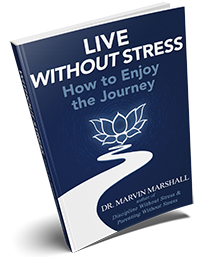 What are the three (3) essential procedures for stress management? How does the language you choose shape your thinking and feelings? What are some simple strategies to significantly reduce stress? What one (1) skill can anyone learn to reduce anxiety and stress? Choice ends when life ends. You are constantly making choices—both consciously and nonconsciously. Being mindful of choices significantly reduces stress. Problems and challenges can be easily resolved with solving circles.